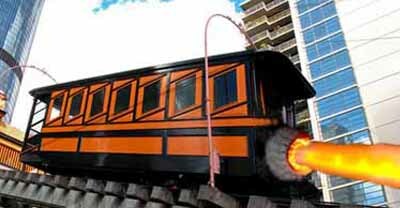 Hoping to burnish his reputation for mass transit innovation (and distract attention from his freebie ticket scandal), Mayor Antonio Villaraigosa unveiled plans to convert downtown's Angels Flight funicular to an $11.2-billion bullet train. The idea won quick support from L.A. City Council members. "One of the things we like about this project is that it costs so darn much money," Councilman Eric Garcetti said. "Let's face it  we're not that good at fiscal responsibility, so it's better to focus on what we do well." Villaraigosa said the bullet funicular would drastically cut travel time on the Angels Flight Railway, a 298-foot track in Bunker Hill that bills itself as the world's shortest railway. "With the train's 200-mph speed, it's quite possible  according to quantum theory  that passengers will arrive at their destination before leaving," he said.